Apple Vale Alpacas: Alpacas at Glastonbury Festival? 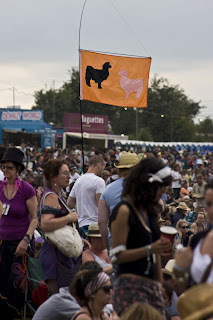 Well they look more like llamas - while we were watching 'Bat For Lashes', I spotted this flag at the festival, and thinking they might be owners or breeders, I followed the pole down to the man on the end of it - apparently his wife has a fascination for alpacas, hence they used this flag to find each other in the crowd - hello again if you are reading this. 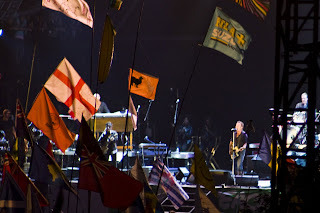 Then looking back through our photo's, we noticed that it had been at the Bruce Springsteen show! I didn't see anything else alpaca-related - I'll have to work on that for next year. Looking forward to shearing soon - no doubt the girls are too. Hey there, I'm the llama-fan with the flag :-) Like the site- your alpacas are gorgeous, particularly Pela who has lovely colouration and a very sweet face. The flag started off as llamas but they got fatter due to sewing techniques so looked quite alpaca-ish by the time I'd finished. Good luck with the cria; glad to see all going so well. What a great idea to use the flag to find each other. I had a friend who always took a blow up banana to things! Llamas look very cool too. Great idea to track down the owners and find out more about them. Next year I hope you take an alpaca flag!